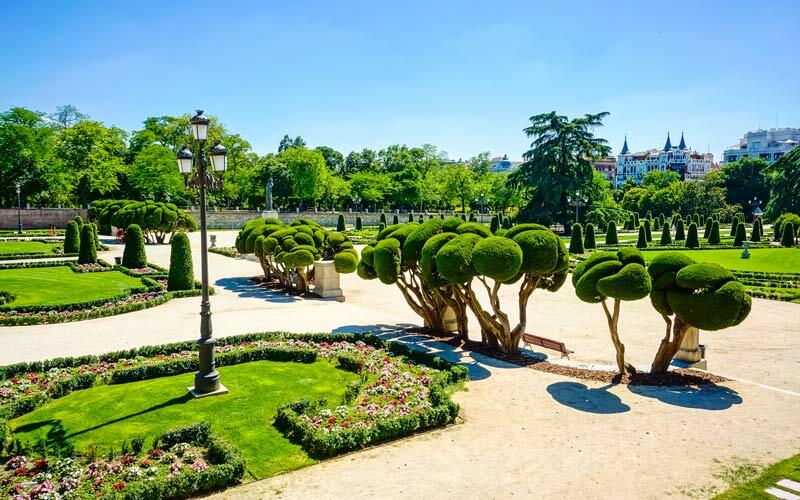 The Jardines del Buen Retiro, or The Retiro, as the Madrileños call it, is the green heart of Spain’s capital city, its great open-air space (occupying 118 hectares) where you can find music, mimes, fortune tellers, caricature artists, and vendors. It is a playful and popular place that is unorthodox and open to all. In 1767, the illustrious king Carlos III first opened part of the Jardines del Buen Retiro to the public, all of whom had to follow a certain dress code: “No one may enter the park with their heads covered, in this way, the men must reveal their hair, without hat, netting, or mount, nor anything but a decent suit; this includes jackets and capes of any kind.” This was called the “Aviso al público para el paseo a pie en los Jardines del Palacio Real.” However, in the 17th century, people from the villages were permitted access to the royal gardens on occasion to witness spectacles. The opening of the park on a regular basis during the reign of Carlos III was, without a doubt, a first step toward the democratization of the Spanish parks. This would come with the creation of the first truly public gardens, created specifically as such, that surged in the 19th century, a necessity provoked by the industrial revolution as a respite from the oppression of the pollution in the big cities and the need for fresh air. But let us return to the regal origins of Buen Retiro, which owes its name to the Cuarto Real, an annex of the monastery of San Jerónimo, where the Spanish monarchs would sometimes retire for a moment’s peace. This was the reason for the creation of the Palacio de Recreo del Buen Retiro, which arose during the reign of Felipe IV, between 1630 and 1640. It was situated what was the outskirts of the city at the time, and it came to occupy an area that equaled half od the capital. With an austere exterior of brick, granite moldings, and a slate roof, the only part of the colossal palace that is still standing is the Hall of the Salón de los Reinos and the Casón del Buen Retiro, which are both part of the Prado Museum. As pointed out by the historian Consuelo Durán, the main draw of the Buen Retiro was the gardens, although these presented the same lack of unity in their design as did the architectural conglomerate. We find this lack of symmetry in construction too often in Spanish architecture! The park was made up of different areas, some formed by formal, geometric hedges; but others we more forest-like, with walkways covered by trees, orchards, and hermitages with hermits living in them. Water also played an important element in the park, which featured ponds, streams, and fountains. The most important of these was the Estanque Grande (The Great Pond), which still exists, which was used for naval battle reenactments (Naumaquias) and theatrical festivals where the works of Calderón de la Barca and Lope de Vega were performed. It is difficult to imagine a better example of the garden than on a summer night with its dense greenery, its lovely smells, its sounds, and its freshness. While the park was a courtly place of recreation, it also served as a venue for tournaments, bull-fighting, hunting, and banquets. With the death of Felipe IV in 1665, the age of splendor of the Retiro came to an end. The Retiro that we know today looks completely different from the way it did in that time. The only vestiges are the Great Pond and the Ochavado Pond. Political events as well as landscaping trends have been changing the face of the park for more than three centuries. The arrival of the Bourbons to the Spanish throne at the beginning of the 18th century with Felipe V also left an impact on the Retiro. This marks the period called the Parterre, in which the great Gallic architect Robert de Cotte was commissioned to remodel the park, which despite subsequent modifications in the 19th century, still maintains its original design of a central axis and its parterres off to the side, reflecting the French gardens with its predilection for open spaces and symmetry. It was originally part of a grandiose project to turn the sober Palacio de los Austrias into a baroque chateau. The Guerra de Independencia (1808-1814) proved a catastrophe for the Jardines del Buen Retiro. For four years, it served as the camp ground for the invading French army. The buildings and the gardens alike were razed, and thousands of trees were cut down. However, when Fernando VII came to power, the gardens were restored with a massive movement to replant the trees. The entire park was opened to the public, except for a small area, which was called El Reservado. This was an area reserved for the exclusive use of the royal family. A romantic garden was created in this private area, with small, picturesque constructions. They are now known as the Casita del Pescador and the Montaña Artificial. Following the tradition of exhibiting exotic animals in the royal gardens, the monarch also had the Casa de Ferias constructed, which was later converted into the Zoológico de Madrid. In 1868, the Jardines del Buen Retiro passed into the custody of the city, making it the first public park of Madrid. It was in this new age when the Paseo de Carruajes was opened, a point of meeting for the high society Madrileños, and the Crystal Palace was constructed to house the exotic plant life exhibited at the Exposición de las Islas Filipinas of 1887. Among the many renovations and additions that the park has undergone, it is worth mentioning the anachronistic statue of Alfonso XII that dominates the Great Pond, finished in 1922, and the areas created by Cecilio Rodríguez. One of these, La Rosaleda, was designed in 1915, following the model of the Jardín de la Bagatelle in Paris and the formal gardens bearing its name, of 1941. 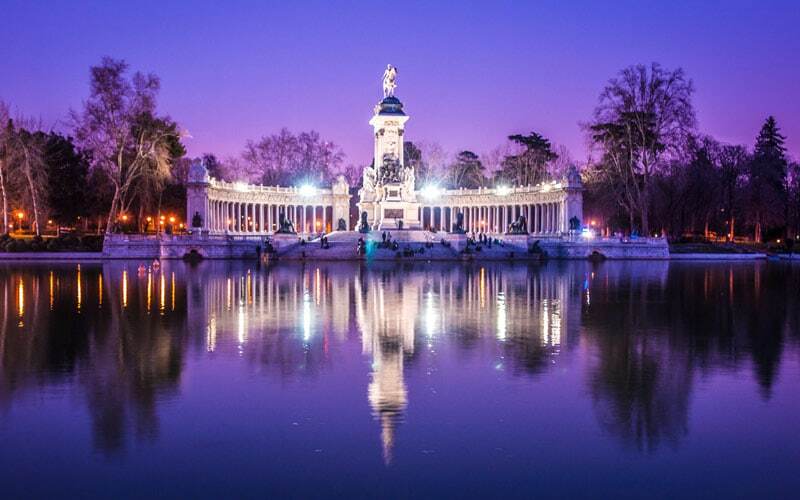 The Retiro is today, without a doubt, the most emblematic and lively park of Madrid, which is still evolving, with its recent creation of the Bosque de los Ausentes, a commemorative monument to the victims of the terrorist attack on Madrid on March 11, 2004. 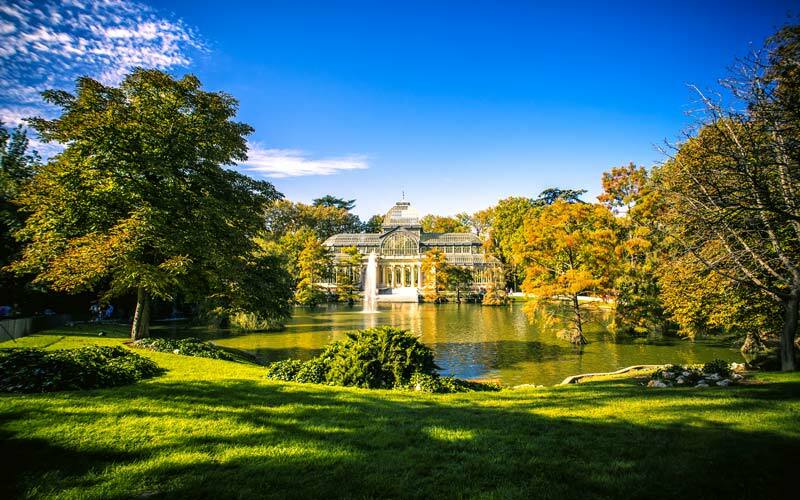 For the Madrileños, the Retiro offers a breath of fresh air and greenery; a refuge from the Castillian city that can be glimpsed in the distance.